Ring Wars Carolina: Upcoming Event: "Candy Bowl 2017"
Upcoming Event: "Candy Bowl 2017"
Ladies and Gents, The time is creeping up very fast. Ring Wars Carolina presents its annual "Candy Bowl 2017" event in Lumberton NC October 21, 2017! Who is going to be in the Bowl? Will Popo da klown finally appear? Will Drew Thomas make a decision to return? Will James Miranda risk his 24/7 No Limitz title to compete in the Candy Bowl? You just don't know who is going to TRICK or TREAT who? Kids will be picking candy and wrestlers to compete! You don't want to miss this event! 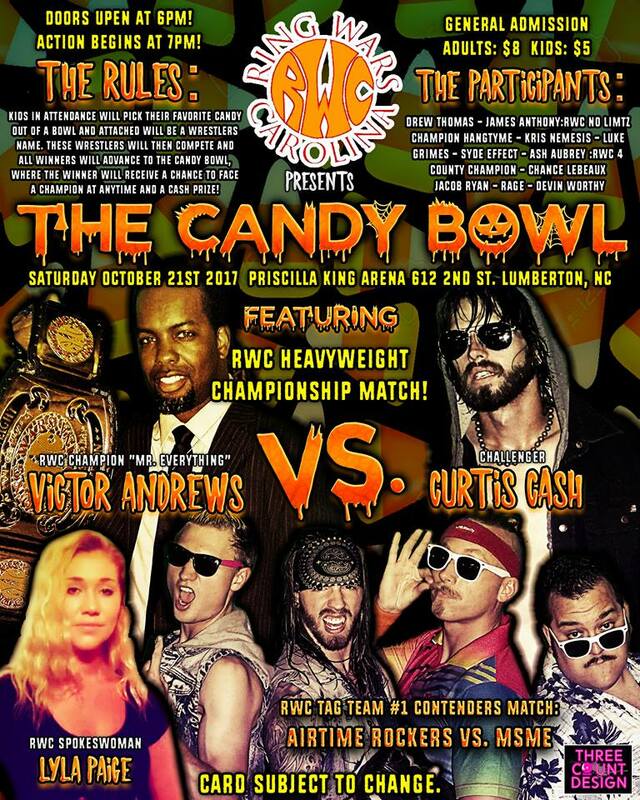 See you October 21, 2017 in The Priscilla King arena located at 612 2nd street Lumberton NC for the Annual "Candy Bowl 2017"!!! !